Over £4,000 to our Raising the Roof fund. I wanted to take this opportunity to thank everyone associated with the event for helping make it a success, from those who helped organise and set up the event and those who tidied up afterwards, to those who attended and who contributed to the night. 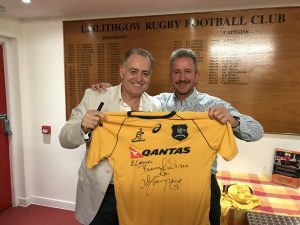 Thanks to Colin Watson and Alan Mitchell (straight from the cask) who donated items to the evening and to Colin for his tireless work behind the scenes in the planning and execution of the evening. Big thanks to Ken Christie for lending us his PA system for the evening. Special thanks to Alan Lawson of the Bill McLaren Foundation who not only organised David Campese to attend, but who drove him to and from the dinner in addition to hosting the Q and A session and running the auction. Alan does a superb job running the Bill McLaren Foundation, along with his wife (and Bill McLaren’s daughter) Linda and John ‘Pundy’ Thorburn, who’s also the current Hawick Rugby Club President. 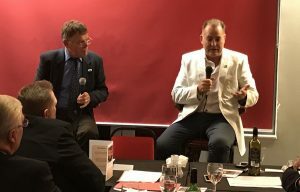 Thanks, of course, to David Campese for fitting us in to his busy schedule and for such an entertaining evening. The meal that Roddy and Martin served up was superb and a big thanks go to them and to the waitresses, waiters and bar staff who helped the evening go so smoothly. As the French say – “chapeau”!